The Syrian-Russian Joint Coordination Committees on Repatriation of displaced Syrians held US responsible for the death of children in al-Rukban camp. Two days ago, two children died in the camp due to malnutrition, poor sanitation and infection and because of the destructive position of Washington and its indifference to the lives of innocent little inhabitants of this camp. The two committees confirmed, in a joint statement Saturday, that the situation in the camp, which is similar to ” ghetto”, continues to deteriorate and the current dangerous health situation is a matter of serious concern. According to the representative of the World Health Organization in Syria Elizabeth Hoff, there is no doctor in the camp and continue to develop life-threatening infectious diseases. Many cases of diarrhea, hepatitis and skin diseases have been identified in addition to the death of two children due to malnutrition, poor sanitation and infection, the statement said. The committees’ statement clarified that the US illegally occupies al-Tanf zone and restricts the activities of international and non-governmental humanitarian organizations on the territory, using ” Maghawir al-Thawra” terrorists. The statement renewed that the Syrian government has long been ready to disband the camp and receive its inhabitants in the areas chosen by them. A sufficient number of residential facilities have been prepared for accommodation. The necessary stock of food, potable water, bedding and medicines has been provided. The Syrian authorities, according to the statement, have formed and are in constant readiness of 6 car columns of comfortable buses ready to move at any time to al-Rukban camp to evacuate displaced people . The committees once again called on the US side to show mercy and finally to open access to the occupied al-Tanf zone, to give the opportunity to take out the suffering residents of the Rukban camp, to stop their suffering and to allow them to live freely in their native places for the speedy restoration of peaceful life in Syria. 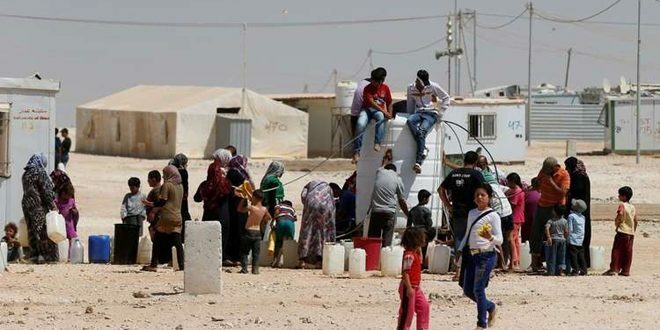 On Friday, the committees confirmed that the US occupation forces, through their terrorist mercenaries, continue to prevent the arrival of convoys to evacuate displaced people from al-Rukban camp.